If you’re a small business, a school, or even local government, the Fargo DTC1250e ID Card Printer is the right solution for you. 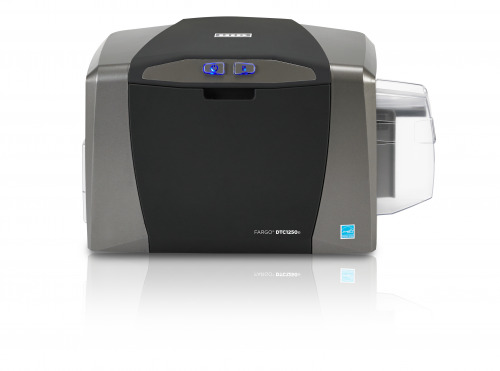 A printer/encoder, the Fargo DTC1250e ID Card Printer prints quickly and produces 50% more visually-rich, full-color credentials that look highly professional. The Fargo DTC1250e ID Card Printer is designed to not take up too much space to fit in anywhere in your office environment. It’s easy to make custom ID badges on the spot thanks to the included Swift ID badging software. You can even upgrade the Fargo DTC1250e ID Card Printer with the iCLASS SE encoder, letting you print secure, personalized photo IDs in a single, easy step. The embedded iCLASS SE encoder in the Fargo DTC1250e ID Card Printer lets you personalize and encode ID cards on the same printer and in the same process. You can encode cards with unique company or employee information and program them to work with a variety of access control systems.